The U.S. military is gearing up for a massive new exercise, dubbed exercise Pacific Blitz, to test its ability to fight a joint battle in the expanse of the Pacific Ocean. The large-scale exercise, slated to kick off sometime between Feb. 21 to April 7, will involve all elements of the California based I Marine Expeditionary Force, or MEF, and service members from the Navy, Army and Coast Guard. The exercise will be the first iteration of Pacific Blitz and will encompass amphibious operations and even feature U.S. soldiers working onboard U.S. Navy ships, a mission generally the purview of the Marine Corps. Pacific Blitz "is designed to test our forces' ability to plan, communicate, and conduct combined amphibious operations over great distances. Forces will enhance expeditionary logistic capabilities and rehearse concepts in simulated contested environments,” Staff Sgt. Daniel Wetzel, a spokesperson with I MEF told Marine Corps Times in an emailed statement. The exercise will take place at sea, the Naval Base Ventura County and other military training facilities across southern California. 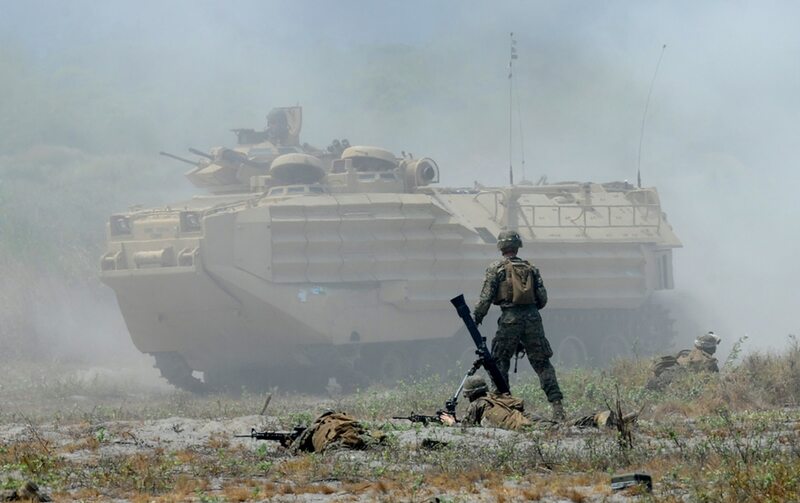 The Corps said the exercise is a hybrid of two previous exercises dubbed Pacific Horizon and Dawn Blitz, but the new training evolution will be more expansive and include a joint service element. In Oct. 2017, during exercise Dawn Blitz, the Corps successfully test fired a rocket artillery system known as HIMARS from the deck of the amphibious transport dock Anchorage. It’s a capability the Corps may find useful if it goes to war with China in the vast expanse of the Pacific Ocean. And the 2017 iteration of Pacific Horizon prepared Marines and sailors to move supplies and logistics from sea to shore. The exercise comes as the Corps is amid one of its largest shifts of forces to the Pacific since WWII, as the force prepares for a major fight with China. The majority of the Corps' 30,000 plus Marines forward deployed overseas hail from III MEF and are predominately stationed on the Japanese island of Okinawa. The Corps is trying to redistribute some of those forces to Guam and Hawaii, while also bolstering training rotations to Australia. Distributing the force across the Pacific makes any concentrated attack by Chinese forces more complicated.